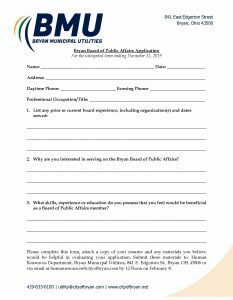 The Bryan Board of Public Affairs (BPA) is seeking applicants to fill the unexpired term of BPA member Bob Eyre, who resigned effective January 24, 2019. Eyre was appointed to the BPA in 2018 to fill the unexpired term of Bill Pepple which runs through December 31, 2019. 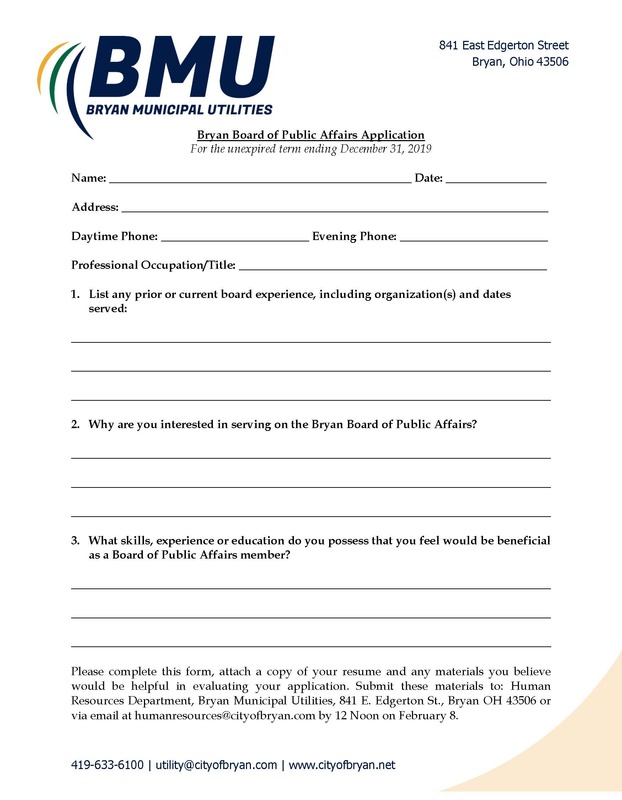 Interested individuals should submit an application and resume for BPA consideration in filling this vacancy to Bryan Municipal Utilities, c/o Human Resources, 841 E Edgerton St, Bryan, OH 43506, or by email to humanresources@cityofbryan.com. Resumes must be submitted by 12 Noon on Friday, February 8th. Applicants must be a resident of the City of Bryan. The BPA application is available below or can be picked up at the BMU office. The Board plans to conduct interviews with prospective Board members the week of February 11th.